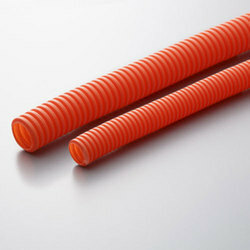 Double Wall Corrugated ( DWC ) HDPE pipes. 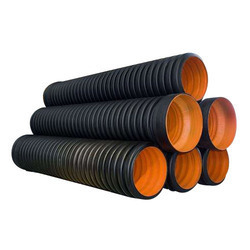 Double Wall Corrugated ( DWC ) HDPE pipes are similar to normal HDPE pipes except that they have different external & internal surfaces which gives them additional strength and stiffness. TeleRex Pipes are specially designed for underground cable ducting. Made from HDPE, TeleRex caters to the Power, Signal, Telecom Cable and Optical Fibre Cable Ducting requirements in India. It is a widely utilized product by many sectors such as Indian Railways, Airport Authorities, State Electricity Boards, Power Distribution Companies, Public Works Departments, Telecom Companies and so on. Brand Tele-Rex REX POLYEXTRUSION PVT. LTD.
Cable trays, concrete channels and pipes are commonly used in India for routing of electrical cabling for power distribution and for protection of communication lines.These are the alternatives which are utilized in place of open wiring systems, which can be dangerous for many reasons.The application of these systems is expansive and is used in almost all projects where cables are used. Excellent corrosion resistance Anti Rodency No Flame Propagating Properties Multiple colour options available facilitating identification Chemically inert Excellent Impact Strength Good Abrasion Resistance Easy jointing process.